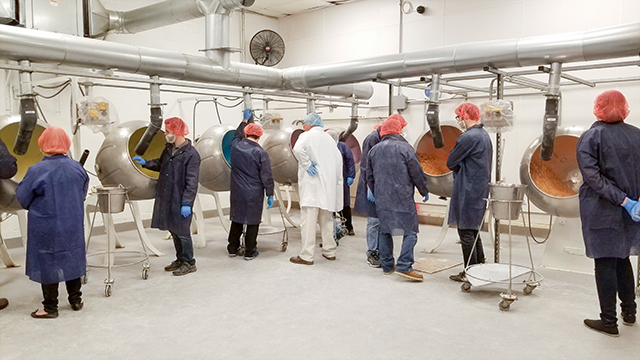 (PMCA — November 13, 2018) — Thirty-two students representing a variety of companies participated in the PMCA Panned Confections Short Course held November 6-9, 2018 at Richardson Brands in Canajoharie, NY. Six experienced and highly-skilled instructors provided a mix of classroom and practical training related to panning basics, soft, hard and chocolate panning, panning room design and layout and finishing and polishing. Each student received a course book as well as electronic copies of presentations and handouts and took home a variety of sample product they made with their fellow students. Eric Fernandes, Mantrose-Haeuser Co., Inc.
Aadil Khan, ASA Enterprises Ltd.
Susan Coleman, Mantrose-Haeuser Co., Inc.
Walt Vink, Vink Associates Inc.